A Christmas tree is typically well – a tree. But who says it has to. Here is an outside tree made from salvaged tires. Spray painted green and decorated from largest to smallest from bottom up. If you have access to tires this would make a great outside setup or display. 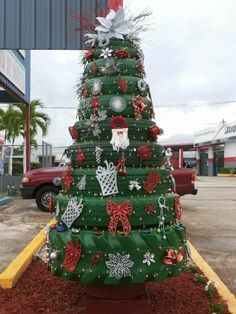 This entry was posted in Crafts ~ DIY ~ Projects, ~Christmas and tagged display idea, holiday, idea, packages., setup, tire, tires, tree, xmas. x-mas, ~Christmas. Bookmark the permalink.